By default, Cloud Dataprep can access data within the Google Cloud Platform project from which Cloud Dataprep is run. To give your Cloud Dataprep project access to a Google BigQuery dataset owned by a different Google Cloud Platform Console project, you must make the dataset accessible to the service accounts in your Cloud Dataprep project. If you grant Cloud Dataprep access to a dataset in another project, disabling Cloud Dataprep will not remove these permissions. The permissions must be manually removed to fully revoke Trifacta access to datasets in other projects. 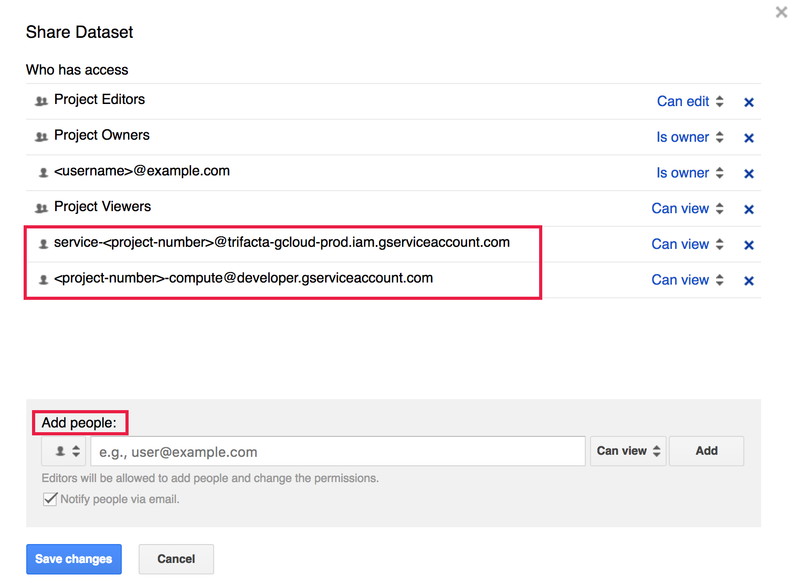 This section shows you how to use the Google Cloud Platform Console to grant service account access to a BigQuery dataset owned by another project. See Assigning access controls to datasets for information on using the command line or APIs to grant access to datasets. 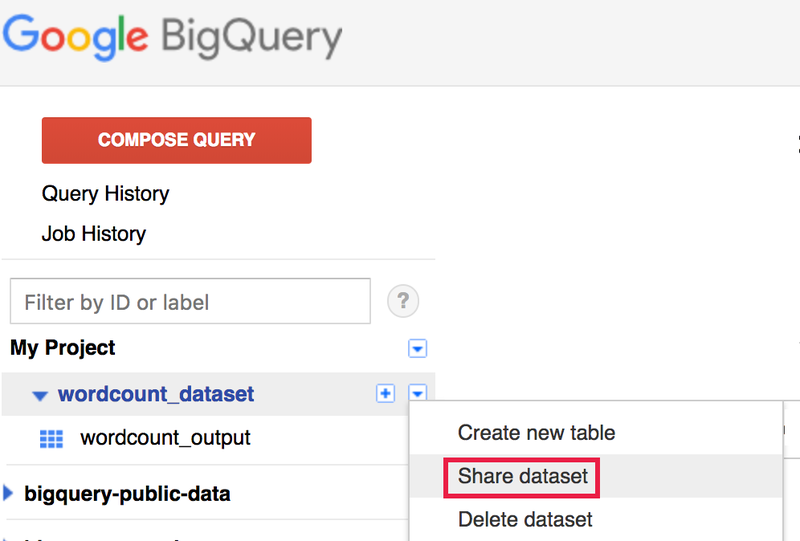 Open the BigQuery UI and locate the dataset you wish to share with Cloud Dataprep. Click the drop down arrow next to the dataset’s name, then select Share dataset. Use the Add people field to add the compute and trifacta service accounts, then click Save changes. Open the Cloud Dataprep "Import Data" page, then select BigQuery from the left pane. By default, your current project is chosen in the breadcrumb bar. Select BigQuery to move up one level. Enter your GCP Console project ID in the Go to Project text box to view and select the dataset shared with Cloud Dataprep. Open the BigQuery UI, click the drop down arrow next to the dataset’s name, select Share dataset. Click the "X" to the right of the compute and Trifacta service accounts to remove their access to the dataset.